Let's revive "create your own Touhou" thread. Not gonna lie, I have a ton of ideas for Touhou OCs, especially since I roleplay on sites like Twitter and whatnot and I would love to share most, if not all of them but I worry about suffocating this thread with a bunch of silly OCs. But should I? Should I do it, anyways? Post all of them, albeit in intervals? Share if you got em', no one's gonna judge you for having too many. I'm gonna post two of them for now and will bring in more later. Here is one of my first OCs and another one I chose to write about. And the way i go when making OCs is that I try to make as many that would fill a game's worth of girls. I even make little hypothetical plots and everything here. 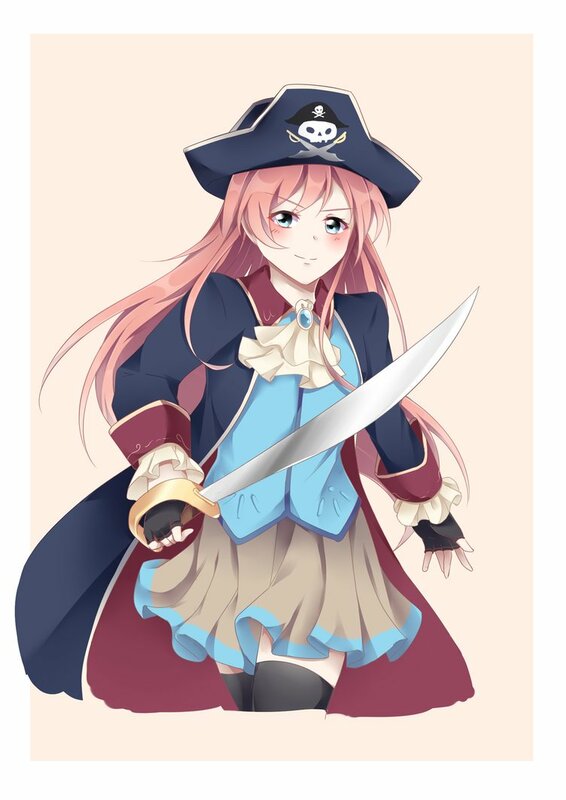 Personality: A cocky and boastful individual due to her pirate heritage(Father being a feared pirate, Implied to be related to Ching Shih), Lei is proud to be one and due to being thrown into Gensokyo, she wants to show the land who she is and be feared. Though she is a bit naive and has self-confidence issues if someone questions anything about her. She does care about people who she does gain her trust or people in her family(Like her Sister, who I'll write later). Marisa Kirisame: Sees as a rival. Marisa doesn't care about her all that much, despite Lei persisting to try and proclaim she will outdo her. Minamitsu Murasa: Lei takes personal offense to Murasa and will try to insult Murasa whenever she can. Appearance: Extremely long, white hair(Longer than herself even). Black, checkered overshirt with a white long sleeve shirt on. A tie that resembles both the Minute hand and second hand off a clock Long, black boots. Wears belt with a tons of arrows resembling said clock hands too. Hecatia Lapislazuili: Both Chronos and Hecatia are long time business partners of sorts who benefit from each other at times. Yukari Yakumo: Another person who have a mutualistic relationship of sorts. In the event of any time-related incidents hitting Gensokyo, Chronos will investigate it while she will use the land as a Vacation spot from her old home. Sakuya Izayoi: Chronos detests it when mortal beings use time powers out of fear it may cause some time paradoxes or disruptions to time itself. Hearing Sakuya is a human who can use time absolutely disgusts her to no end and will berate her at every chance she gets if she meets her. I can probably go in more detail about these two and others later on. I have so many here it is not even funny. And the two OCs I pulled out are related in some way, which I can go into details later. Personality: A bit of a jerk and a bully. Very prideful, likes to pick on others who are weaker than him but is a dirty coward who will play dirty given the chance, especially against stronger foes (of whom he dislikes.) 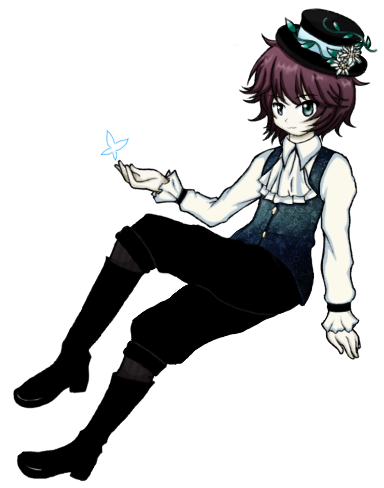 Childish due to being a fae creature though he's a lot more smarter than fairies. If he's acting polite and buddy-buddy but isn't your friend, he's either hiding or wanting something. Relationships: No long term/personal ones exactly, but his full Bio details that he is acquainted with 3 residents of Gensokyo due to an incident he inadvertently caused. I have my own Touhou pictured in my avatar. It’s just, I’m not sure whether Camellia Knowledge counts as a “real” Touhou. She does have a personality and a backstory, but she’s so weak in danmaku that she would probably never get recruited. I believe Camellia’s magical bullet attack skill level might be slightly below mid-boss. This thread inspired me to name Camellia Knowledge a.k.a. Hieda no Mukyū’s special ability: Capable of mainly locating any history book or historical document in her immediate vicinity. Capable of mainly locating any history book or historical document in her immediate vicinity. Extremely powerful if you have entire shelves full of the stuff. And in a pinch, a heavy book to the face is just as effective as danmaku, I'm sure. Still haven't gotten the old stuff off my old PC, which means I don't have much on some of my other Touhou OCs. Though I did write down one of my more minor OCs. Ability: Able to create 1000 Written letters at once. Age: 100s of years old. Appearance: A Brunette Youkai with brown eyes with a pink/blue jacket that doubles as a dress and skirt with some badges on them. She carries a courier bag. Has a Newsboy cap on with a large badge on top. Long, brown boots. Personality: Nao is optimistic and happy-go-lucky whenever she tries to deliver her mail to people. If people refuses her mail, she gets depressed and eventually angry enough to try and force the letters to people(Sometimes trying to stuff them in their throats!). She values her mail and will listen to literally anyone if it means delivering mail to people. Relationships: None to think of at the moment. And yes, I imagine this girl as a Stage 1 boss. And she may be the weakest and most pathetic OC I have ever made, despite me adoring what I made here. I feel like even the weakest characters in canon could beat her up! But I still enjoy her as one of my OCs. Though I imagine her ability would make some creative looking danmaku, even if it is pathetically weak. Personality: Incredibly polite, but forceful. Does not discriminate between friends or enemies, good or evil, or previous dealings. Her only concern is selling her products to as many as possibly. She gets one day off each year and is noticeably more laid back and selfish on that day. Location: Lives in Heaven, can be found anywhere that there are potential customers. -As the daughter of the Jade Emperor (Heaven's political head) she garners respect from Celestials and Heavenly gods. However, since Heaven is a meritocracy, she doesn't actually have much political power among them. -She has a husband whom she is permitted to visit every year, once a year on her day off so long as it doesn't rain on that day. However, recently they've been having relationship issues. Instead she's been spending her vacation travelling abroad. Human Friendship Level: High. She treats humans, youkai, gods, and all else equally, and has no intention or need to attack them. Threat Level: Highest. Coming across her is incredibly dangerous for anyone. Those who she views as potential customers will inevitably find themselves completely bankrupt, with nothing but piles of clothing and fabric to show for it. Admittedly, they are high quality wares. Countermeasures: She has a weakness to rain. While caught in it, her speed lowers to significantly more reasonable levels. Of course, as her speed is so high she can generally escape the area before the rain begins. Karada is a featureless ghost of a woman, wearing but simple white one-piece dress covering most of her body leaving only small portion of her ghost tail visible. She has blue eyes and long dark-brown hair. Karada is seldomly seen. She is only visible when moving simple things around the houses she haunts. But, even then, she can do so without making herself visible. People who have seen her says that she is not too tall but not too short either, looks like she is a woman in her mid 20s and has a ghost tail instead of legs. She is also emotion-less: her eyes always half-closed, neither showing joy, surprise or any either emotions. When seen, she immediately disappears: so, she is either shy or doesn't want to be found out and runs away. She seems to be quite smart with her actions and her actual voice was never heard and does not interact with anybody so we know nothing else of her personality. Karada (real name unknown) was, once, a gentle, enthusiastic woman that loved the easy life and help people out. When she entered adulthood, however, she was forced to marriage to a man whom she did not love. She was forced to stay home, have 5 kids in the same amount of years. Her mental health rapidly dwindled. Before then, she was seen as a quite intelligent woman but, as her mental health went bad, she was found out to be quite the airhead and make stupid mistakes. Her husband started hating her stupidity, started being violent toward her while faking the situation to their children and her status to the people around him. Then, one day, with a body full of injuries from the beatings, with obvious madness, she assaulted her husband and killed him. Seeing what she has done, she followed to kill herself; leaving the kids behind. Being rejected in the afterlife, she became a ghost (vengeful spirit) that haunts people so they become insane (or develop other issues) in return as a form of vengeance. There's also a rumor about her that she has simply no name but because she has a tendency to move things around, just some simple things mostly (activate a toy, drop a small object off a table, etc) she was named "動く物体" (Ogoku Buttai). But since then, over the years, there were some sights of her. It was discovered that she was female so people named her Dounari Karada (動なり特体): dou is alternate reading of 動 (moving). 体, Karada, can mean "body", "physique", "corpse" but, also rarely, "object". なり was added simply to make her last-name more last-name worthy. Her abilities are from the classic haunted house stories (that I personally believe) where people hear somebody walk in the attic, unexplainable moving objects, etc. (A/N: Here is a good story about this and what prompted me to create this character. First part and Second part) She is able to touch material things, immitate voice, make any kind of noise. So, to an extension of that, she is able to shapeshift her ghost tail into legs so she can "walk" in attics and, you guessed it, to cause noises. Obviously, any humans hearing these will rush to see what's wrong just to see that there's nothing there. On the medium to long term, she can cause insanity, anxiety and sleep issues to humans. She either moves with the same humans when they think the house is haunted (AN/: well, it is, lol) so she can continue to haunt them later. She moves to another house when she's found out or starts to be ignored by the residents. Overall, her human friendship and threat level is extremely low and High respectively. She will not kill but she will not hesitate to enjoy the harm caused to them.